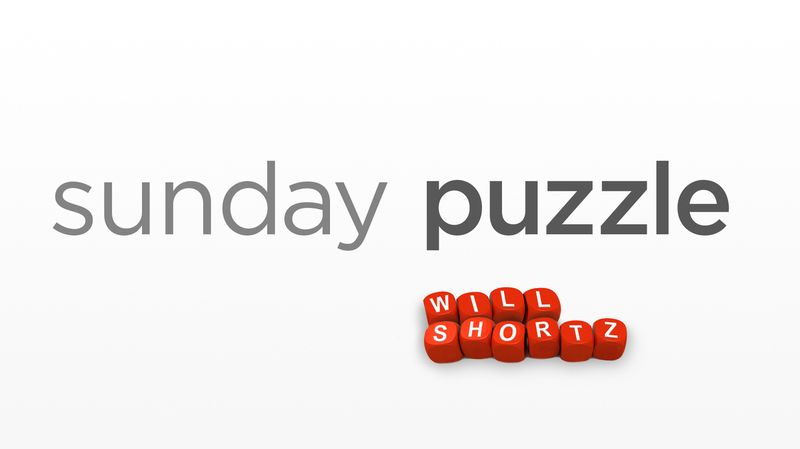 Sunday Puzzle: Familiar Phrases Weekend Edition's Lulu Garcia-Navarro and Puzzlemaster Will Shortz play a word game with KPBS listener Geoffrey Mayne of San Diego, Calif.
On-air challenge: Every answer today is a familiar three-word phrase or title in which the first and last words are the same. I'll give you the middle word (and a clue, if necessary). You tell me the phrase. 6. THOUSAND — The number of "Arabian Nights"
7. GLORIOUS — Song from "Oliver!" with the lyric "Just picture a great big steak / Fried, roasted, or stewed"
Last week's challenge: This puzzle also involves rhymes. It comes from listener James Matthews of Little Rock, Ark. Think of a common seven-letter word. Drop its second letter, and you'll get a six-letter word that does not rhyme with the first. Alternatively, you can drop the third letter from the seven-letter word to get a six-letter word that doesn't rhyme with either of the first two. Further, you can drop both the second and third letters from the seven-letter word to get a five-letter word that doesn't rhyme with any of the others. What words are these? Winner: KPBS listener Geoffrey Mayne of San Diego, California. If you know the answer to next week's challenge, submit it here. Listeners who submit correct answers win a chance to play the on-air puzzle. Important: Include a phone number where we can reach you by Thursday, Dec. 13, at 3 p.m. ET.